The perfect place for your rustic and romantic barn wedding or event! Thank you for your interest! Rentals are now booked through 2019. 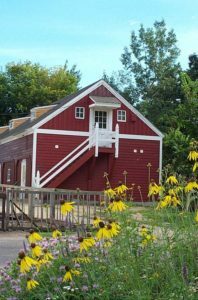 The historic site features a restored Minnesota Native prairie, which serves as the backdrop for our 1800s farm buildings. 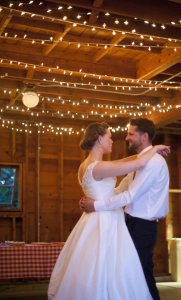 The Red Barn provides a rustic indoor space which accommodates 80 guests. 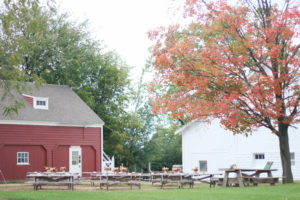 The adjacent courtyard is surrounded by the historic Gibbs Farmhouse, the One-Room Schoolhouse and the original White Barn. With a rented tent set up in this space, the site can accommodate up to 250 guests. Gibbs Farm is located between St. Paul and Minneapolis, just west of the Minnesota State Fair Grounds in Falcon Heights. Parking is free for wedding guests and our lot can accommodate 60 vehicles. On-site, adjacent parking is available. These costs include the wedding ceremony and reception, or event, as well as the amenities listed below. Gibbs Farm: Red Barn & prairie flowers. You may choose from this list of preferred caterers. All Gibbs Farm preferred caterers provide bar service. Gibbs Farm does not offer tents or chairs for rent, tables are limited in availability. We are happy to work with you and can provide the names of rental suppliers. 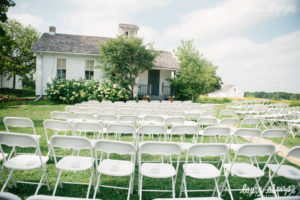 Please call the Gibbs Farm Office at 651-646-8629 to schedule an event space tour. 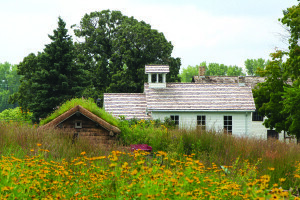 Gibbs Farm prairie, sod house and schoolhouse. Gibbs Farm, listed on the National Register of Historic Places, is one of the first farms in Minnesota. At this unique site, we interpret the real-life relationships of Jane Gibbs, her family and their friend’s from Cloud Man’s Dakota Indian Village. Over 25,000 children and adults visit the site each year.